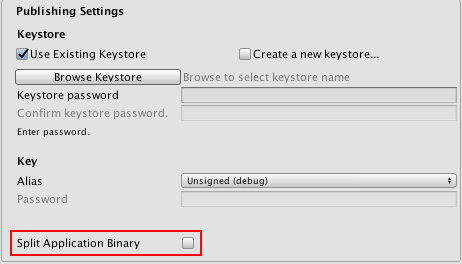 If you select Build and Run, the APK and OBB files are installed on your device by Unity. If you select Build and want to install the app manually using the ADB utility, you must first install the APK and then copy the OBB into the correct location on your device. The OBB file name must correspond the format required by Google. Refer to the expansion files section of the Android Developer documentation for more information. If the app starts and can’t find and load the OBB, only the first Scene is available (see documentation on how data is split between the APK and OBB below for more information). Do not use the contents of the OBB separately - always treat the APK and OBB as a unique bundle, the same way as you would treat a single APK. APK - Consists of the executables (Java and native), plug-ins, scripts, and the data for the first Scene (with the index 0). OBB - Contains everything else, including all of the remaining Scenes, resources, and streaming Assets.